It's hard not to be captivated by Serge Brideau. 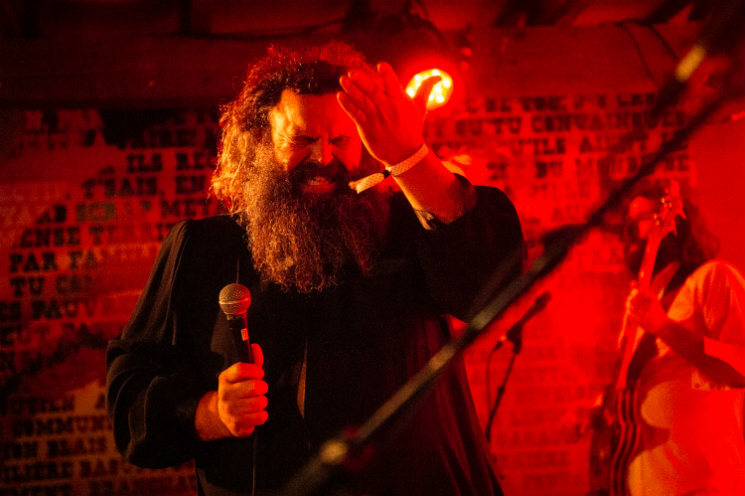 The giant, bearded, dress-clad lead singer of Acadian rock crew les Hôtesses d'Hilaire has an animated, larger-than-life personality to match his look, and he served as a hilarious, jovial tour guide into the complex cultural world of the band's home province, New Brunswick. Proudly acknowledging New Brunswick's status as Canada's only bilingual province, the band launched into a tight set of rockabilly, surf rock and rock'n'roll performed in Chiac — the Acadian Franglais dialect best known to Anglo audiences from Acadian rap troupe Radio Radio. Tracks like "Super Chiac Baby" from 2015's Touche​-​moi pas là unpacked les Hôtesses' relatively unique linguistic status among Canadian music with trademark humour. "We are the dream, the crème of the cream," howled Brideau. And later, "I'll French you right on the English. Come on, we have the same lips!" Add in a bunch of classic rock guitar soloing courtesy of guitarist Mico Roy, glitzy keys courtesy of Léandre Bourgeois and his array of synths and a tight rhythm section, and you have a series of rollicking rock tracks that are just as interesting as Brideau's persona and lyrics. Brideau spent much of set centrepiece "MDMA" off-stage as the band dove into a lengthy jam, equal parts psych, surf and Krautrock, but the set remained just as engaging. Effortlessly weaving disparate parts together is the New Brunswick way, and les Hôtesses d'Hilaire honour and disseminate their cultural history, from their Chiac lyrics to their rock odyssey sound.